Doug Feldmann, author of Keith Magnuson, interviews live on "WGN Midday News" on WGN-TV. Keith Magnuson was featured on the website for Northern Kentucky University. Keith Magnuson was featured in the Daily Herald. Keith Magnuson was featured in the Daily Chronicle. The article also appeared on the site Huskie Wire. Keith Magnuson was featured in the North Shore Weekend. Doug Feldmann, author of Keith Magnuson, was interviewed on "On Point" on CKDJ 107.9 FM. Keith Magnuson was featured and reviewed on the official site for the Chicago Blackhawks. Keith Magnuson was featured and reviewed on the official site for the SecondCityHockey.com, an SB Nation blog. Keith Magnuson was reviewed on Committed Indians, a Chicago Blackhawks blog. Keith Magnuson was reviewed on Sportsology. When Keith Magnuson signed as a free agent with the Chicago Blackhawks in 1969, no one could have predicted that the rookie redhead would soon become the team's chief fighter. During his 11 seasons with the Hawks, Magnuson was a rough-and-tumble defenseman, firing up his team and their opponents by racking up 1,442 penalty minutes. He was captain for several years, played in two NHL All-Star Games and graced the cover of Sports Illustrated in 1970. Magnuson died in a tragic car accident at the age of 56 in 2003. 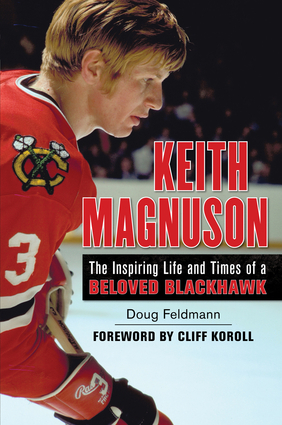 Chronicling the hard-hitter's life on and off the ice, Keith Magnuson: The Inspiring Life and Times of a Beloved Blackhawk (Triumph Books, October 2013) by Doug Feldmann with a foreword by fellow former Blackhawk Cliff Koroll pays tribute to a true hockey legend. Remembered by fans as a tough enforcer, Magnuson is one of only seven Blackhawks whose jersey number has been retired. Magnuson impacted the lives of many in his pursuits off the ice as well. He formed the Blackhawk Alumni Association, which aims to provide scholarships for high school hockey players in Illinois. His hard work and dedication to his team, hockey players and others in need is a legacy that continues today. A must-have keepsake for Blackhawks fans, Keith Magnuson: The Inspiring Life and Times of a Beloved Blackhawk celebrates the life of one of the most beloved hockey players in the history of Chicago. Doug Feldmann is a professor in the College of Education at Northern Kentucky University and a former scout for the Cincinnati Reds, Seattle Mariners, and San Diego Padres. He is the author of numerous books, including El Birdos, Fleeter than Birds, Miracle Collapse, September Streak, and St. Louis Cardinals Past and Present. He lives in Cincinnati, Ohio. Cliff Koroll and Keith Magnuson were teammates growing up in Saskatchewan, at the University of Denver, as well as on the Chicago Blackhawks. He delivered the eulogy at Magnuson's funeral and is the current president of the Blackhawks Alumni Association. He lives in Chicago, Illinois.